Here’s the link to the charity Save the Children. Feel free to share this link with others! Do you prefer Sanderson’s books over Patrick Rothfuss’s books? I want to star reading fantasy and I don’t know which series to read first, what do you recommend? The name of the wind or Mistborn? Is it purely sci go or does it have fantasy elements? Great review. 🙂 I just started my first Sanderson book (Mistborn)! It’s my first adult fantasy read so it was a bit of a rocky start (no one warned me about the Steel Inquisitors and how gruesome that description would be, ewww) but I’m getting a lot more into it now and really hope I end up loving his works. Spensa sounds like a great character to read about. Was the book super SciFi in your opinion or do you think it would appeal to non-SciFi readers too? I wasn’t a fan of his Reckoners series. It was decent but by book three I stopped caring. I think I may put off non Cosmere for awhile. I’ve barely scratched the Cosmere surface! I just got this book yesterday. I’ve never read anything by Brandon Sanderson either. I hope I like this! I read this for your book club. I didn’t do the group chat this month, but I still read it. It was my first Sanderson and I LOVED it!! I thought the Reckoners books were fun, but definitely not as enjoyable as Brandon Sanderson’s other works, I don’ think it was the fault of it being YA, just the world itself didn’t speak to me as much. I am very interested in this book though (I’ll read YA forever!!). Just curious, how deep does Brandon S. go into how technology works in the world, does that also take a “back seat”? Personally, i did not like it that much, even if Brandon Sanderson is my favorite writer. Book is fun to read, but it is same old same old in young adult genre, one good thing is that there is no romance and that is what i like in BS books or very limited romance. Hopefully other 2 books in trilogy will give us something new and not just happy ending for main character, when one or 2 of his/her friends dying. I mean it is sanderson so of course I am going to read it! I only read the Mistborn trilogy and i was planning to read Warbreaker but i left it in a hotel room in Ottawa! I’ve been wanting to read Sanderson. Do you think this would be a good one to start with? 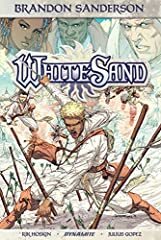 Again, I envy you Americans so much for the cool cover… I got the hardback edition as well, but here in the UK we only have the British one available, at least for now… That is, unless I’m willing to pay close to three times the price plus overseas taxes, just so I can have it delivered from America. Now, about the book – it’s really great! 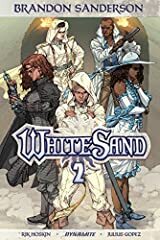 The pacing is very quick and something that Elliot didn’t mention in her review is that the chapters are really short – like usually no more than 5-6 pages. I got so used to the pacing and the short, fast-paced chapters that I am now “struggling” a little bit to get into Mistborn. My Mistborn series literally arrived the day after I finished reading Skyward, so I am 100 pages into Mistborn now and I’m like “Oh, this is kind of slow. And they’re explaining all of these things and bla-bla…” Don’t get me wrong – I’ve bought the entire trilogy at once and I’ll read all of it, and I’m sure it picks up a little bit further, but compared to Skyward I am finding Mistborn to be a little bit overwhelming. 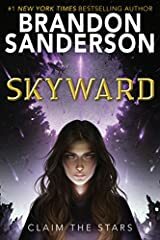 I am also finding it rather awkward to see myself, a male at the age of 25, being absolutely IN LOVE with Skyward, given that it’s clearly targeted for the younger part of the Young Adult genre, but I suspect a large part of it has to do with Sanderson being an absolute genius! I had high hopes for Skyward, but this book went WAY BEYOND my expectations! I still find myself contemplating about it, thinking about certain parts of the story – it has really impacted me! Look, guys – there’s literally no guarantee that you’ll like the book; People’s tastes vary. But… Chances are that you WILL like it, given the fact that the reviews are overwhelmingly positive – both from ordinary readers, as well as from journalists and professional reviewers. Ive been wanting to check this book out since I heard about it! I have yet to read anything by Sanderson and I think I’ll very much enjoy his writing. What’s your favorite of his more adult books? Wow this review is exactly what i need! I’m on the fence buying Skyward, I’ve never read anything Sanderson, and was planning to get the Mistborn trilogy first. I read a lot of young adult scifi and fantasy. Do you think i should pick this up first? I’m a little intimidated to start Mistborn. But middle grade books arent my cup of tea either, if Skyward is sort of transitory to young adult. I loved it!!! Can’t wait for book 2! I really felt like i was in that cockpit with Spensa, the dogfights were written SO WELL! Great review! It tipped the scales for me and now I know I’m not going to read this one. I enjoy YA but it sounds more Y than A to me, plus I don’t really like sci-fi, so it’s a no-no. Even though it’s Sanderson, this is where I draw the line, like with Reckoners and White Sand. It just makes me a little sad because there’s nothing new for me coming from Sanderson in a long time… I’m not even excited for The Lost Metal (whenever it may come out) as I didn’t enjoy the Second Era Mistborn all that much. *sigh* Please, Brandon, write some new Cosmere books! I really loved this novel. Can’t wait for the next one! Google Talk to Books: Best literature review tool ever! YA FANTASY MASHUP BOOK REVIEW!